Migration is "slowly" picking up and while I, like many other birders are eager to see the return of those spring migrants. I have not forgotten those wintering birds and have been spending some time enjoying the ones in my backyard as they will soon be moving on. 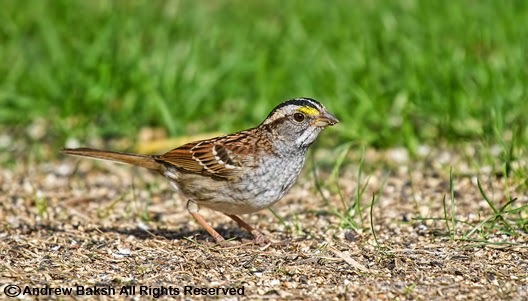 One such bird is the White-throated Sparrow (Zonotrichia albicollis). This is a bird that beeds from Yukon and the Northwest Territories south to northeastern Minnesota and Pennsylvania, east to New England and Newfoundland. Nests, can be found in brushy or semi-open mixed woods. Its wintering range includes much of the eastern United States with small numbers in southwestern states and could be found on wood lots, scrub lands, gardens, and backyards. They frequently visit bird feeders like mine. This is a fairly large Sparrow and sexes are similar with females generally duller than males. The photos of 3 different birds below were all taken in my backyard on April 15th, 2015. You get an idea of the variation in plumage. Let's look at the first photo which shows a rather handsome WTSP. This adult bird shows the striking head pattern showing the broad white supercilium and the bright contrasting yellow supraloral. The white throat is surrounded by a gray face and chest. This second photo is another adult bird but take a look at the plumage and compare it to the bird above. This bird shows less dark gray in the face and chest. What about the post-ocular stripe? It looks browner on this bird. How about this bird? Look how this bird shows even less yellow in the supraloral compared to the two birds above. What about the stripes? Do you notice the striping on the breast that run towards the flnak. We don't see this with the first bird but we do see some of it on the second bird. There is another field mark on this bird that is common with WTSP number 2. Look at the throat on this bird, it shows thin malar stripes which we see on the second bird but not the first. When I observed these two birds in my backyard, I wondered if these were what are referred to as "tan-striped" WTSP. What do you think? 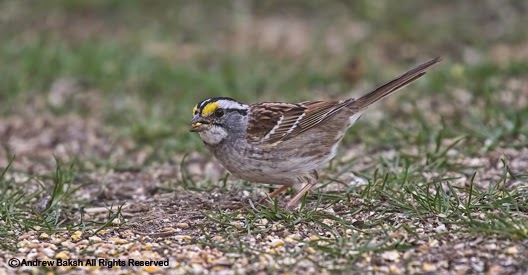 Have you seen White-throated Sparrows like this on the East Coast that looks like this? Here is a tidbit on White-throated Sparrows. Do you know that both sexes may sing? Find a bird you think might be a female and see if it sings. The best time is early in the morning to watch them singing. While doing my first Long Island shorebird survey of 2015, I found my 1st banded Piping Plover of 2015 on Dune Road--Tiana Beach, on Long Island. 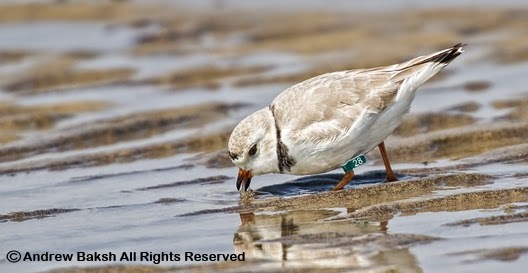 I sexed this bird as a female after watching it for a while and comparing the breast and forehead band against that of another Piping Plover, which I presumed was a male. The presumed male PIPL looked slightly larger and also had a bill that showed more and brighter orange at the base. Sexing Piping Plover in the field is not easy, but after carefully studying these two birds yesterday I was pretty comfortable that my banded bird was a female. 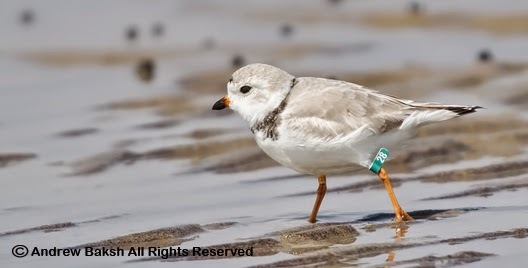 The scheme of the bands reminded me of the PIPL program of Virginia Tech and of a few Fire Island banded birds I found last year, so I e-mailed Dan Catlin one of the coordinators who confirmed that my banded bird was from one of the Fire Island project. Audrey Wilson a team leader of PIPL monitors who I met last year out at Cupsogue and was copied on the e-mail also provided additional information that confirmed the bird was a female (yay on my sexing) adult that was banded on Fire Island in 2013. Apparently, this bird had one chick in 2013 which did not survive. In 2014, this bird attempted nesting twice but was unsuccessful in both attempts. The location that I found her, is different from last year and hopefully she will be successful this time around. If you find a banded bird, write down all of the information you could glean, including behavior and then attempt to contact the appropriate sites to report your find. On this blog are links to sites to submit banded birds re-sightings. 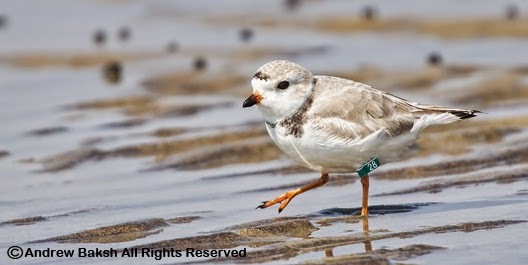 Reports on any banded birds are critical to the studying of such species especially an endangered one like the Piping Plover.